Now in its fourth year Illuminate SF Festival of Light shines a light on 35 dramatic, eco-friendly light art installations — nine more than last year and more than four times the number of the inaugural celebration in 2013 — accessible by public transport and free for all. From Thanksgiving 2016 through New Year’s Day 2017, art lovers are invited to embrace the power of light and tour San Francisco’s art installations by a diverse range of local and world renowned light artists. Illuminate SF Festival of Light, presented by the San Francisco Travel Association, has grown to include intimate artist talks, museum tours and a myriad of other light art activations across the city. The 39-day celebration offers the rare opportunity to connect with local artists, with the addition of artist talks, Museum Saturdays, neon light tours and a stargazing party in the Presidio during the longest nights of the year. These complimentary tours, talks and participatory experiences will once again highlight the newest permanent and temporary installations. 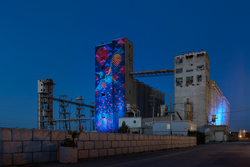 This, all in addition to the city's crown jewel, Leo Villareal's, The Bay Lights, now permanent and dazzling and best viewed when the sun sets just before 5 p.m. throughout December. The works come to life at dusk throughout 12 San Francisco neighborhoods with a luminescence that will turn any evening into an illuminating adventure, especially when combined with exploring San Francisco’s world-class restaurants, museums and cultural events. The light art can be found throughout the city in neighborhoods in the Embarcdero along the waterfront, in North Beach, Civic Center, Central Market, the Inner Sunset, SoMa, Potrero, Mission Bay, Bayview, Golden Gate Park, Hayes Valley, the Mission District and even flying in or out of San Francisco International Airport (SFO). Dec. 3, 17, 2016, 9:30 a.m. - 5 p.m. at SFMOMA, 151 Third St.
December 3, 2016, 7 p.m.-9:30 p.m. at the Presidio Main Parade Ground. Presidio Stargazing Parties are perfect for families and people of all ages interested in seeing the universe through a telescope. The San Francisco Amateur Astronomers bring telescopes and amateur astronomers to guide you, unveiling some of the night sky's most interesting astronomical beauties. See the moon, planets, nebulae and galaxies up close and learn some of the constellations at a star tour. Bad weather cancels. For registration and information visit http://www.presidio.gov/events. For details on the artists and installations celebrated in Illuminate SF, visit http://www.sftravel.com/media. *San Francisco’s Civic Art Collection encompasses more than 3,500 objects, including historic monuments, murals, paintings, sculptures, installations and other media. The San Francisco Arts Commission oversees this rich and diverse collection, which helps distinguishes the city as an important cultural destination. To learn more visit http://www.sfartscommission.org. San Francisco International Airport (SFO) offers non-stop flights to more than 44 international cities on 38 international carriers. The Bay Area's largest airport connects non-stop with 78 cities in the U.S. on 13 domestic airlines. SFO offers upgraded complimentary Wi-Fi with no advertising. For up-to-the-minute departure and arrival information, airport maps and details on shopping, dining, cultural exhibitions, ground transportation and more, visit http://www.flysfo.com. FollowSFO on http://www.twitter.com/flysfo and http://www.facebook.com/flysfo. Note to editors: Press releases and other media resources are available at http://www.sftravel.com/media The San Francisco Travel Photo Video Library is available at http://barberstock.com/sanfranciscotravel. For news and story ideas, follow @SFMediaRelation on Twitter and @OnlyinSF on Instagram.